When people say that life is about gathering experiences, they’re probably not talking about cleaning out your gutters. In our gorgeous Independent Living apartments in Cincinnati, OH, you can ditch the jobs you’ve dreaded for all those years and focus on living life to the fullest. Each of our private Independent Living apartments comes complete with a kitchenette, all appliances, and a floor plan you can fill with your favorite pieces from home. You'll also have access to housekeeping and laundry services, a calendar full of exciting activities, and of course, a community of people who share your love of living the good life. Contrary to popular belief, the good times aren’t over. In fact, at The Glen, they’re just getting started. Make a list of your worries and responsibilities. Now crinkle it up and throw it in the trash. 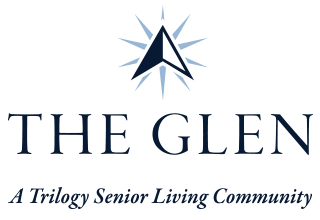 While we invite you to bring your favorite furniture, memories, and hobbies to The Glen, we ask that you leave what’s weighing you down behind. Chores like washing your windows, mowing your yard, or trudging up and down your steps with a basket of laundry are now in the past, which leaves your present open to be filled what brings you joy. From cookouts to exercise classes, movie nights, in-house concerts and more, you’ll discover that your schedule fills up quickly. But for once, you won’t mind at all.